Bernie runs an 8-figure electronics brand, founded the eCommerce tools company Efficient Era, and is the author of the book Flywheels and Feedback Loops: A Guide to Success for Private Label Sellers. When he's not running his businesses, you can usually find him on top of a mountain near Seattle, WA. Welcome to the podcast Bernie. Hey, Arlen. Great to be with you. Yeah, thanks a lot. Well, Bernie, why don't you before we get started, you know, the topic for today's discussion is going to be you know, improving your products how to move your products up and Amazon product search, which I know a lot of them is not sellers are always struggling to do so, I know this is very interesting to be an interesting discussion today and very timely but before we get into that, why don't you tell our listeners a little bit about yourself your background and how you got started and where you've got to how you got to where you are. Today? Yeah, great. I don't know what the heck I'm doing on this podcast Arlen because I am not a marketer. I'm actually a geek more of it that test tech guy. No, but actually, you know, I started this electronic company called pluggable Technologies in 2009 with the goal of being a better device company really focused on kind of products and technology and customer service and around that time Amazon was really On The Rise and so was able to kind of focus on Amazon as a sales Channel and really let down. On due to some degree. Well, all of all the sales and to some degree most of my marketing now as the years have gone on Amazon has become a much more crowded platform and our own marketing efforts have become very critical and it's a very difficult if you really got to do all the right things to be successful in the Amazon today. But yeah, and so as part of doing that and some of these things are related to marketing. I had to write a lot of software automation to make things scale an Amazon and to create the right interactions kind of related to that the book you mentioned the flywheels and feedback loops to make sure the right things were happening with customers that would eventually result in good reviews and better sales. And so that that software we've got big enough that we've spun it out and offer it to other Sellers and there's about 600 other. Is it selling Amazon that use our efficient era software? Okay, so now okay great. We had that sounds awesome. Well, as far as Amazon is concerned. I know we have a fair share of our listeners that are already selling products and online and on Amazon and I know there's some people that are out there that are interested in selling on Amazon. But of course, you know the main concern in the main question is going to be you know, how do you get how do you improve your search results? So if let's say I'm selling umbrellas. And somebody goes Amazon types and umbrellas. How do I improve my result listings that I appear higher up? That's you know, that's going to be that's really the number one question. How does somebody even begin to start improving where they end up in the Amazon results, right? Yeah, you know you search on umbrellas on Amazon, you know, you're probably going to get fifty thousand or a hundred thousand products back for the from that right you could you could have the best umbrella in the world the highest quality. Awesome, umbrella at the best price and that first day when you launch it at on Amazon, it's going to sit there at the bottom of those a hundred thousand search results. And that's just that's just the reality of Amazon gotcha. So use multifaceted. I mean, you've got to have a great listing that when people well, okay, so let's start you got to have a great title and Main image that are compelling that are accurate so that when your product finally does come up in somebody's search results for Percy particular search that. Got a high conversion rate from Impressions. So somebody clicking on that and looking at the details of your product. Then the rest of your product listing again needs to be high quality compelling the quality of your listing, you know reflects on the quality of your product and they don't really know the quality of your product. So in a sense only your listing can kind of speak to you know, what the quality of the product is, right and it's got to be the product they're looking for so whatever it was that you let's just say advertised for. To be really appropriate for that search or else you're going to now lose it you're not going to have conversions from those detail page views to an actual sale. Right? So once you've got a product, you know that is described as accurately and with this high quality as possible, then it's all really about kind of feeding the front end of that funnel. You've got a high converting photo. Hopefully at that point at least for certain audiences and now it's a matter of getting that Right audience to come. Your product and you really the number one thing for everybody today even people who used to be kind of into Amazon gamesmanship of various sorts of the last few years today. The number one way really for everybody is on Amazon ads sponsor products ads action Amazon's ad business is going gangbusters. I think last quarter they. I mean it was some kind of crazy increase in Revenue Amazon had four adds up to a few billion dollars a quarter or while there's a reason for that. They're very effective. You're basically when you're spending money on ads and you're saying, you know, well, my umbrella is special because you know, it's got you it's more durable because it's got, you know, kind of steal something instead of aluminum, you know for the for the supports on the umbrella if you. And advertise on those characteristics of your product that are actually Superior and or things people are looking for drive those people to your listing have that be high converting that those people look at the product like it buy it and then positively submit positive reviews for it Amazon system is all designed around that feedback loop, you know, they'll basically Amazon is constantly looking at historical data. Say, you know, is this the right product for this keyword and are these people having good experiences and then they push you up and search organic search results for those keywords, right? So they sponsor products ads are really the way that you create data points for Amazon's algorithms or another way of saying it is your training Amazon. I see on what your product is high converting for and what it's not. So yeah, so that's you know, those are probably the number one things, you know, the listing and the ads there's. Things that people do that it start shading into things of little bit of either gray manipulation of the system or even kind of black hat manipulation of the system. But Amazon is constantly trying to reduce the effectiveness of those things and so great listings and and well targeted ads are the things that will kind of never change I see now, is it possible to increase your you know, I guess you're ranking so to speak as far as the. To concerned without doing the sponsored ads or is it just you going to get a better chance to kind of I guess raise your hand in the in the Amazon system when you're doing these sponsored ads? Yeah, the the sponsored ads are pretty much Essential. Now, one of the kind of gray things that has been popular. The last few years is. Pretty much giving away. A lot of units are doing 90% off sales and then having something called a two-step URL where in order to get that discount you tell people to go search for something on Amazon and then that and then that product that you're selling at a huge discount will come up for that search. Okay, and and that is providing data to Amazon. You're basically trying to motivate customers through a very large discount to do a search behavior that than Amazon, you know, we'll use as an input. It and say oh, okay. This is a high converting product for that keyword ice cream. But Amazon has been that's been something another one of these practices where Amazon has cracked down on aspects of it. Okay, there's ways you can still do that that the still work but like a good company that that kind of focuses on that area is a company called viral on and they are all about those big giveaways and these mechanisms of trying to get the buyers of the big giveaways. To do specific searches before they buy so that your you know, basically feeding Amazon keyword associations between the product and those keywords, but sponsor product ads our way of doing that not just for you know one or small set of keywords, you can do, you know, you could be advertising on hundreds of thousands of keywords and it is, you know, truly as designed. I mean, you're just showing ads to people and Amazon. It's a it's a completely white hat. Of basically training Amazon's you know Amazon's algorithm. I see I see I see I see things have changed quite a bit as far as their sponsored ads are concerned and I hadn't heard about that strategy of having people do specific searches but it makes sense because at the bottom the bottom line is, you know on the on the backend Amazon is you know, there's a whole algorithm figuring out what searches are returning what results and what are people clicking on after they search for a certain keyword. So that makes sense. But yeah, I can definitely see. They could quite easily crack down on that but you know the I guess there's other ways to improve your rankings. Now. I know one of the concerns that a lot of people have when you know existing in the Amazon ecosystem or even considering jumping in there is you know, I'm I going to as a business am I going to be handing over control? Of my customers to Amazon and my is there a risk in losing customers? Actually, Woody? What's your thoughts on that? Yeah, it's absolutely a huge trade off. We do have this on this tool set of our own efficient Dara and one of the things it does is ADD automation covering the stuff we just talked about but that tool is also in the Amazon app store, which is in Seller Central and in order to get into that App Store. We actually had to remove a bunch of features Amazon asked. Remove a bunch of features related to customer connection. Wow, because we were basically trying to you know help you kind of find a customer's that maybe will repeat buyers or large order buyers. We were trying to or we were providing features to connect customers with reviews and absolutely contractually as part of your agreement of selling on Amazon and just the way I was on systems work Amazon is is trying to maintain complete control. Over the customer which is really interesting because you know that's on one side of the coin on the other side of the coin when it comes to taxes and Regulation and things like that. Amazon will say, oh, we're not the the seller it's not our customer. It's that it's that third party customers customer, right? So, you know, they try to you know, have it both ways depending on what's beneficial to them. Right? But absolutely Amazon, you know makes it either impossible or or. Lee difficult for you to ever contact your customer again after they buy from you, you know, certainly it's part of the contract very explicitly knocked a remarket back to that customer. Okay. So one of the big challenges on Amazon is. You need you need to be able to when you launch a new product Drive momentum and traffic to Amazon to get that Flywheel spinning to get that data it to get those sails into the top of the funnel and and to move your product up in search results. But if you hand all of your customers Amazon, you will have no assets in terms of a customer base that you can directly Market to and that can sustain your business over time. You'll be wholly dependent. On you know, your Amazon search position and have no control, you know over your own they really aren't your customers. Okay, I see and it's a balancing act and I think every every smart price especially private label seller every brand on Amazon needs to think about this carefully and it's probably that you do both in the sense that of you have to be prepared to hand your customers to. On an order to launch new products and get momentum spin up on those but as products mature and you kind of have gotten to the position you want to be on Amazon. You need to start actually taking some of those. Not handing all of those sales to Amazon and actually, you know building some of your own customer base. Okay, just so you have some you know customer Assets in terms of emails phones if phone numbers addresses that you can Mark remarket to, you know, so that you can then launch those future products. Okay. So there is a little bit of a kind of a life cycle there around building customer assets when Amazon is really trying to prevent that that's really interesting and you actually. Answered one of my my later questions that I was going to ask you as far as relying totally on Amazon as your main vehicle for selling your products, you know, there could be a businesses out there that are you know, they've got a product down their want to get it out there like, okay great. I'm going to go through Amazon. I'm going to sell everything on Amazon. I don't want to have to worry about coming up with my own website. I don't want to worry about the credit card processing any of that the Fulfillment the shipping. Let me just hand everything over this to Amazon. You're effectively saying is that wouldn't may not necessarily be the best idea because as far as the customers are concerned you really don't own the customers and and essentially you if you're going that route you really have no assets other than your actual product, correct? Okay conscience. Yeah, that's that's a touchy situation. It's very interesting seeing because you know Amazon is really Open Marketplace per se but in a way not really. I mean if they are and they aren't so they kind of try to play both sides of it, but everything that they're doing is is really beneficial for them. So I think what sellers really have to really understand as you mention is you have to really totally really be concerned about your interests and building your own customer relationships with platforms that outside of Amazon. I'm as I can definitely be a great complimentary channel for sure and there's a lot of people profiting from it, you know, you can't have all of your eggs in one basket. Skid which which I think Rings true with not only this situation would be in a pretty much everything. Yeah, but you know, it's tough for the Amazon because the Amazon is where the volume is Right today in the United States. If you're selling a physical good and you're not selling on Amazon, you're really not selling it all you're not really reaching the market this videos. There's a few categories where the Amazons not dominant but more and more, you know, any sort of kind of small consumer. Good Amazon is either. Approaching or above 50% e-commerce market share here in the US. Yeah. That's that's that's pretty that's huge really now. We you earlier we talked about, you know ways in which getting people to go to Amazon doing the searches and trying to you know to drive people to your listings there. How do Amazon sellers really effectively create a marketing funnel, you know to continually bring in more customers, of course, you know, we talked about the sponsored listings improving your. You know getting your cap to get captivating titles and descriptions and all of that but outside of the whole Amazon ecosystem, you know, really? What are some other ways to get a continual marketing funnel. And yes. Yeah, and I think it's really it's classic marketing and you know, while once you get a product up in search results you on Amazon, you're going to have a kind of a continuous order stream and revenue stream to get it to that position and then, you know also to keep it. You've got to do all the things brands have done forever, you know, in terms of educating the market content marketing text and video cameras on Advertising developing those customer assets like email lists and using them effectively, right? You know, really really the full gamut. I mean the the seller the the Amazon focused sellers, even who are very successful today. There's very few of them that aren't very, you know, very sophisticated and very good about all the traditional marketing. In the end often their goal is kind of expressed in terms of getting Amazon search results up, but the techniques they use to achieve that and to feed the top of the marketing funnel or all the techniques that marketers have been working on forever. Gotcha. So those things don't really change those same techniques exist no matter what the. The channel is so yeah that totally makes sense. You know, one of the things that I've been really wondering myself because I am a Amazon Prime subscriber and I you know, I were a lot from Amazon and you know, it saves me a whole lot of time as it does most people one of the things that I've noticed and I've always wondered how this affects Amazon sellers is their their recent push to develop and create their own products. You know, they have their own that just seems. Just kind of came out of nowhere. There's this I guess amazonbasics is what they call it with some of their categories of products. They're making clothing. Now, I purchased different electronic peripherals and cords and things like that and they're all have that amazonbasics on it. And the pricing seems to be really good. They really seem to be competitive as far as the pricing compared to some other products. Does that do you think their push to put out their own product? Is that really going to have an effect? What pose a threat on you know the everyday Amazon Seller? Yeah, absolutely. It creates a top on your kind of a high-end on your success on Amazon. We've now had you know twice in our company's existence where we had gotten to the top of a large category and Amazon had the best-selling product and it's only a matter of time before amazonbasics in our case with electronics will come in and basically look at all the characteristics. Some of that top seller and duplicated. It happened. We sell USB products. So it happened. We were the number one selling USB hub. Amazonbasics did that we've been the number one selling USB docking station. Amazonbasics just add that the spring. Wow, in fact in both of those two cases. They actually sourced from the same supplier. We're using. Oh wow. So, yeah, I mean, it's straight up, you know, they're just they're just analyzing who. Who's the top seller and we're just going to do that. Okay, and then and then on top of that they're willing to lose money for long periods of time Prime Day this year that that dock that they you know is essentially identical to ours from the same supplier with kind of a different case around it. They were actually selling it at below the cost. They were sourcing it for. Okay. Well, I'm Prime day so they were actually prepared to pay customers on Prime day to buy their product. Okay, and you know how the heck do you compete with that and the answer is you don't write you know, once the Amazon and it's interesting. I mean this is I don't know kind of what Jeff's thinking but, you know the read that side of Amazon's business if you look at their financials is always kind of struggling to make money. Whereas the the most profitable side of their business is. The side of services for Sellers and you know the marketplace side, right? So right now at least at least today Amazon is prepared to take lower margins at in Aggregate and actually negative margins and lots of specific circumstances to help their own house Brands, even though they have a way to make more money very easily by just not doing that and making their money off the third party sales, right? So wow. Weird and ugly reality, you know for third-party Sellers and it's not just Electronics with Amazon Basics, like you're mentioning close Amazon has several dozen Brands and many of them are not recognizable like in dresses. There's Larkin row, you know, they've got Furniture they've got, you know, just all kinds of stuff that are under these brands that don't have the word Amazon in them and they're all doing the same thing. They're looking at top sellers. They're using all that data that Amazon has to go, you know, put Amazon. Own brands on the Amazon market so you know and so what you do is you stay out of the way of all that right? There's nothing there's nothing you can do about it. It's not in your power to do anything about that Amazon has huge resources. And if this is what they choose to do, they're going to do it. So for us we just basically. Need to you know, try to both be differentiated and know that if we have a big seller that the clock is ticking as it's not too long before Amazon themselves will take away that big seller and that we just need to your business needs to be prepared for that. Yeah. That's that's that's totally true. You really can't fight it like you said you just have to be prepared to adjust with it. And you know, they're not going anywhere I think with Amazon there their whole school of thought I think. Coming up with all these products even though they may be taking a loss on it is just you know to get people comfortable with their particular Brands until eventually over time. I think try to get more market share on it because I know when they first came out with these different products that at least had their, you know, their their labeling on it or their name on. I was a little skeptical on buying some of them. So I did kind of think twice and I think they're trying to kind of ease that with with purchasers and customers so that people are comfortable with what they're putting out there. But but after you know, the main lesson with with all of this is just like you said treating Amazon just as another Channel you can get success with it. You can make some money with it, but you can't totally rely on it as your you know, the end-all-be-all channel, you know. It's like pay per click advertising with Google ads, you know, it's a good Channel, but you shouldn't totally rely on it as a lot of people making money but you've got to have your other channels in place. And so I think yeah look at it like that. You know, I think you'll be safe and you know, just you know, like anything you've got to kind of spread out there and and then, you know try to get those customers from a variety of different places. The sellers will do well for sure. Yep, Bernie up there appreciate all of the information that. Provided it. You've provided a wealth of information about Amazon and and what a seller can do in the do's and don'ts and and really kind of the whole landscape. We haven't really covered it too much on this podcast before but before I let you go, I always like to ask my guests just to kind of change of subjects here. What is one thing that our that our audience would be surprised to know about you and you know, it could be anything, you know, you mentioned in the in the lead in the that I do like the hike and get out into the mountains here in Seattle, which is quite beautiful two years in a row. I've hiked to the top of one of the local volcanoes Here Mount st.
Helens the one the blue and blue in 1980. We've got a tradition or we hiked up the mountain and dresses Okay. So I've hiked to the top of the mount the top of a volcano in a dress. Okay. We'll talk. Wow, I guess that is definitely something that the house would be surprised to hear I can help to mount st.
Helens in a dress very interesting. We had we appreciate sharing that that little tidbit. That's I couldn't imagine doing that actually not at all. But I'm sure that was quite an experience. It's fun. Actually if you ever get a chance to come hiking in the Pacific Northwest, it's pretty awesome. Okay, great. I'll definitely do that and Bernie you have any of our listeners want to reach out to you how. To get in touch with you. Well, I can get the copy of the book by going to efficient era.com flywheels and ultimately the book does of course sell on Amazon and then it can just email me at Bernie at efficient era.com and we'll we'll get you connected with any kind of questions or requests that you have. Okay, great. That sounds awesome. 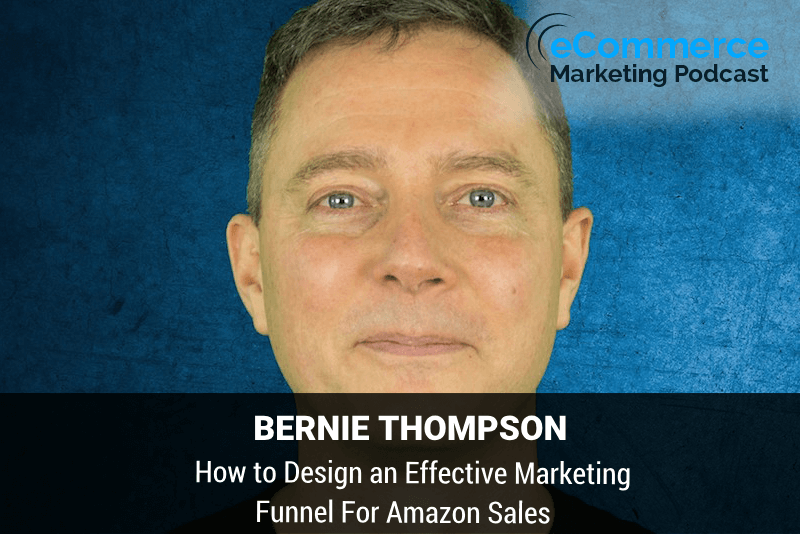 Well, thanks again Bernie for joining us today on the e-commerce marketing podcast. And yeah you provide a wealth of knowledge about Amazon great. Thanks, Arlen. Thanks. Thank you for listening to the e-commerce marketing podcast. You need to get more feedback and reviews from your customers and improve your customer retention.